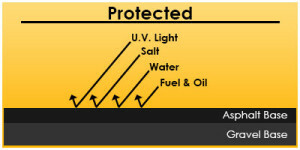 Choose Armored Sealcoating for your asphalt maintenance. We are family owned and operated and we actually CARE. We do our best to respond to all inquiries in a timely manner, no matter the size of the job or even if you just have a question in general. Referrals are the token to success – and we believe you should truly DESERVE every referral you are given. We strive for excellence in all of our asphalt and winter service work year round. We believe every customer should be satisfied completely and we look forward to long term working relationships. Every residential asphalt sealcoating project we work on is important, and we will not call it a job done until it is a job WELL done without question.